Click here to fill out an interest form and get started with one of our instructors! Private lessons are $15 for a 30 minute lesson. Semi-private lessons (2 swimmers) are $25 for a 30 minute lesson. Interested in being a part of a Masters Swim Program? Add your name to the 'I want to swim' list in the pool office. Tentative plans for 6-7 a.m. weekday mornings. Questions ask for Gavin the Pool Office. The Newport pool is a year-round indoor swimming facility located at 225 SE Avery St, Newport, OR 97365, as part of the Recreation Center. Our heated indoor pool is 25 yards, eight lanes, an activity pool with lazy river, and a spa. We offer programming to accommodate all different interests, from quiet time for Mommy and Me, to fun and energized recreational swims. Check out our programs and come by for a swim! 1: Please no shoes on the pool deck, and remain in designated spectator areas if not swimming. 2: Appropriate swim wear only. We do not allow clothing in pool, or inappropriate swim suits. Lifeguards reserve the right to ask you to leave the facility if your bathing suit is deemed inappropriate. 3: Please respect the scheduled times of programs, and leave the area of the pool when another program is starting. Refer to our posted schedules for the appropriate time to attend your desired program. 4: Lifeguards on duty are in charge and are there to ensure your safety. They will enforce rules that help keep everyone safe. Please respect the Lifeguards. 5: No food or glass containers on deck. 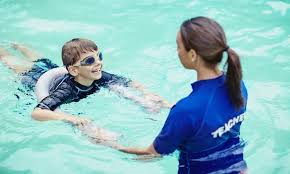 6: Children 6 and under must be accompanied by a responsible older swimmer, at least 14 years of age, and should remain within arm’s reach of that person. Any exception to this rule must be obtained from Aquatic Center staff. 7: Please follow all safety rules posted at the facility. 8: The City of Newport Aquatic Center management reserves the right to ask any person to leave the facility if they refuse to follow facility rules, are distracting lifeguards and inhibiting their ability to safely monitor the pools, or it is otherwise determined that the individuals’ actions are producing an unsafe situation. 1. Age 14 and over only please. 2. Fifteen (15) minutes maximum duration in the spa. If you desire a longer soak, pool staff may ask you to exit the spa for a brief time before re-entering. 3. On occasion the spa may be closed down for cleaning and maintenance. We will do our best to provide a 24 hour advance notice of these closures.